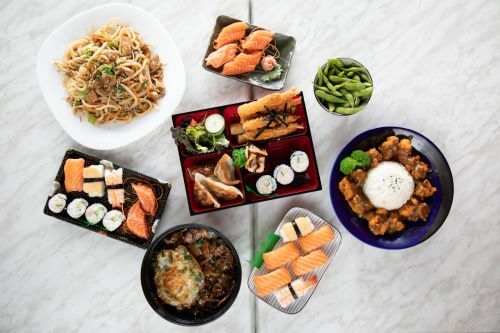 Menulog delivers for Sakana Japanese Cafe so you'll be able to track your courier on a map. Fried tofu with mild Japanese curry. Sliced fried renkon lotus chips. Small - 42 pieces and large - 57 pieces. Gyoza, tempura prawns, crumbed aji fish and spring rolls. Small - 34 pieces and large - 45 pieces. 4 x Tempura prawns, 4 x gyoza, spring rolls, sushi, fruit or salad and side dishes with drink. Katsu crumbed pork or chicken, spring rolls, sushi, fruit or salad and side dishes with rice and drink. Teriyaki beef or teriyaki chicken, 4 x gyoza, fruit or salad and side dishes with rice and drink. Tempura tofu, assorted vegetable, spring rolls, sushi, fruit or salad with rice and drink. Rice stir-fried with assorted vegetables. Rice stir-fried with chicken, vegetables and drink. Rice stir-fried with beef, vegetables and drink. Rice stir-fried with prawn, calamari and drink. Rice stir-fried with grilled eel and vegetables. Teriyaki chicken and avocado with drink or miso soup. Cooked tuna and cucumber with drink or miso soup. Cooked tuna and avocado with drink or miso soup. Crab and avocado with drink or miso soup. Seaweed salad and cucumber with drink or miso soup. Teriyaki salmon and avocado with drink or miso soup. Tempura tofu with mild Japanese curry and drink. Assorted vegetables with mild Japanese curry and drink. Crumbed pork or chicken with milk Japanese curry and drink. Thinly sliced beef cooked with Japanese curry and drink. Fried chicken karaage with curry sauce and vegetables on rice with drink. Sauteed chicken served with teriyaki sauce and drink. Thinly sliced beef cooked with teriyaki sauce and drink. Cooked assorted vegetables and drink. Baby octopus stir-fried with special chilli sauce and drink. Salmon sashimi, avocado and a raw egg on rice with drink. Crumbed pork or chicken with fried egg and drink. Pan fried pieces of chicken fillet in egg with onion on top of rice and drink. Fresh grilled salmon with teriyaki sauce and drinks. Grilled pork belly on rice with drink. Thinly sliced beef with sauce and onion on top of rice and drink. Grilled eel with teriyaki sauce and drink. Mushroom, carrot, onion and cabbage. Crumbed pork or chicken with salad and drink. 5 x Prawns with salad and drink.